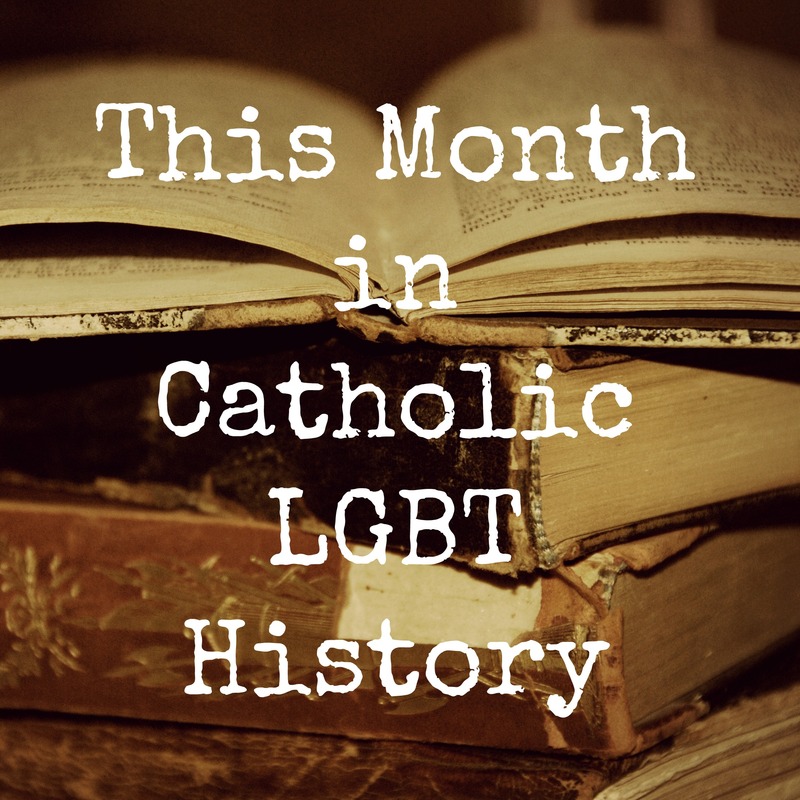 Once a month, Bondings 2.0 staff will produce a post on Catholic LGBT news events from the past 38 years. We will comb through editions ofBondings 2.0’s predecessor: Bondings, New Ways Ministry’s newsletter in paper format. We began publishing Bondings in 1978. Unfortunately, because these newsletters are only archived in hard copies, we cannot link back to the primary sources in most cases. “I’m disappointed the CPA doesn’t respect the judgment of an editor. “As Roman Catholic ministers who have been officially assigned to this ministry by our provincial superiors we believe that much more is involved than a ‘squabble,’ as Msgr. O’Donnell terms it, when our reputations as credible ministers are impugned by a Catholic columnist and we are denied an opportunity to reply. “Mr. Hitchcock says he requested information from us about our position on homosexuality, but neglects to mention that his request came after he made his charges. Since the burden of proof for his accusations rested with him we felt no need to provide him with information. He made the charges. Either he had some substantial and convincing proof or he was simply on a witch-hunting expedition. Apparently he had no proof. This 36-year old journalistic controversy is enlightening because it raises the question whether the Catholic press today, especially the diocesan press, gives fair attention to LGBT issues. So, dear readers, what has been your experience with the Catholic press, especially the diocesan press? Have you ever written a letter on LGBT issue? If so, was it printed? When the Catholic paper you read carries stories on LGBT issues, does it fairly represent all sides of the issue? You can offer your thoughts in the “Comments” section of this post. Be sure to vote for the Best and Worst Catholic LGBT News of 2016. You can vote by clicking here. Voting closes at 5:00 p.m. Eastern U.S. Time on Thursday, December 29th. My main contact was with the St. Louis Review over the years. I had dealings with then Monsignor Ed O’Donnell (later Bishop O’Donnell). I also communicated with a subsequent editor. Every single item about LGBT issues in the several decades of my collection of articles and editorials was negative. Only one person ever condemned violence against LGBT people. That person was Archbishop John May. When Matthew Shepard was murdered, nothing was mentioned in the Review, though there was lots of publicity in the secular press about the killing. I sent letters back and forth to the editor at the time. He admitted they should have written something. But when I furnished him with numerous examples of anti-LGBT violence locally and nationally, and asked if he would address the issue in print, he brought the conversation to a close, and would not agree to write anything either about Matthew Shepard’s death or any of the many instances of violence I brought to his attention. In recent years, the paper reported on a Jesuit who came to town to give a lecture about how transgender issues are not real. The Archbishop some time later wrote an article about the consequences of failing to follow God’s law, and he used as an example, the outrageous statement that “Now we’re sending men into women’s restrooms.” Yet the behavior of Donald Trump bragging about entering the dressing rooms of women and girls while they were naked and changing for their beauty contests was strangely never addressed. That in itself is progress. From a past history of reporting in which all sorts of wild claims were made about gay people, and in which the violence that takes place frequently was swept under the rug, the paper most recently did address the violence against LGBT people, and condemned it. There is a lot more history to be told about the St. Louis Review. I remember well Father Nugent’s appeal to the Catholic Press Association, and the subsequent ruling against the St. Louis Review. In sifting through materials to donate to the St. Louis LGBT History Project a couple years ago, I came across newspaper articles and a letter from Bob Nugent reporting on the appeal. Well done, John Hilgeman, good and faithful servant. You’re a bloody, regular hero. I found this story incredibly sad and joyful. Sad because a Catholic-priest editor had not a sufficiently developed conscience to work out for himself the injustice his publication had inflicted; joyful because there were others mature enough in conscience to point out what that homophobic priest ought to have known all along. The story parallels what is happening in the wider Church today and points up the need for such organisations as New Ways Ministry. Many priests (including Pope Francis) continue to act in similarly homophobic ways: to discriminate unjustly against gay people. And the saddest thing of all is that they appear to do so with quiet consciences. While these men continue to believe that God is honoured by committing such disservice to a section of his beloved people, there will always be a crying need for voices of conscience to accuse them if they will not accuse themselves.